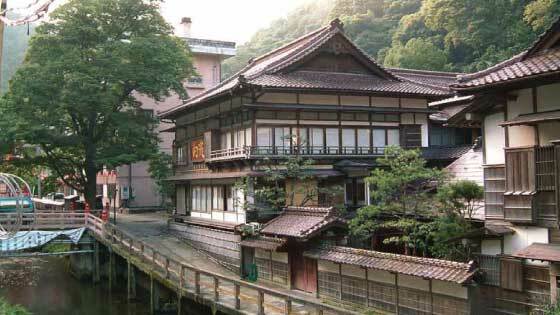 It is a famous tourist attraction in Aizuwakamatsu. You can fee l the beautiful Japanese culture. Tsuruga Castle was built here about 600 years ago. Aizu was a location central in importance to the control of Eastern Japan, and many famous generals from all over the country came and ruled the area. A castle tower, like the one presently standing, was finished about 400 years ago. Usually, the lord of the area did not live there, but came and gave orders from there only during times of battle. Also, about 140 years ago there was a terrible war between the samurai of Aizu and the Meiji government. 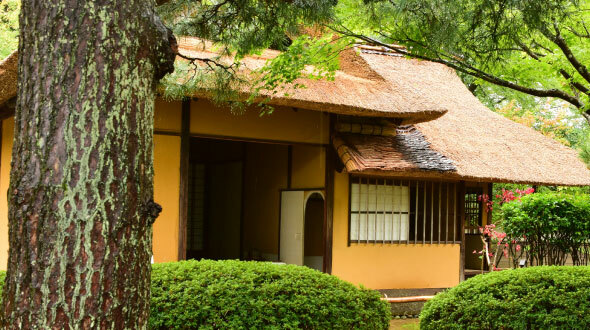 The age of the samurai drew to a close here as those who fought to the end as samurai were defeated by the Meiji government, and the castle was destroyed. The present tower was rebuilt in 1965. The picture which was used in consultation for the restoration is of the castle in the latter half of the 19th century and is said to have been taken by a Frenchman. GAMO Ujisato was famous as not only a great feudal lord and Chr istian daimyo but a tea master, who was a head of 7 disciples of SEN Rikyu. When TOYOTOMI Hideyoshi the shogun ordered the death of Rikyu for treason in 1591,GAMOU Ujisato invited his 2nd son,SEN Sshoan to Aizu in order to protect him and to continue the SEN family and Rikyu`style of tea-ceremony. 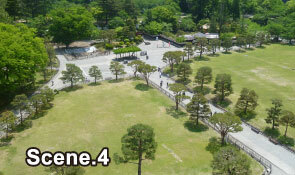 Then SENshoan build Rinkaku for GAMOU Ujisato in the castle grounds. The defeated Aizu clan in the Boshin Civil War moved to Tonami, the northern-most point of Japan proper. In 1872, the Morikawas moved Rinkaku down to their land fearing its demolition with the castle and k ept it in good condition for 120years. In1990,Aizu-Wakamatsu City moved it back to its original place to commemorate the 90th Anniversary of Aizu-Wakamatsu Municipal System and handed it down to posterity. The inside of the castle is comprised of a basement and five floors. It is thought to also have stood this way before it was destroyed. Presently, the first to the third floors make up a museum. The basement was mainly used as a cellar to store salt, and other provisions. This was because salt was not readily available in this mountainous region. Now there is a display set up to give an idea of what the provisions cellar might hav e looked like. On the first floor, an introduction of the lords of the area, as well as an over all history of the region is given. On the second floor, an introduction of daily life for commoners during the Edo Period, and traditional handicrafts of the Aizu region is given. On this floor, a women’s kimono is available to be tried on. 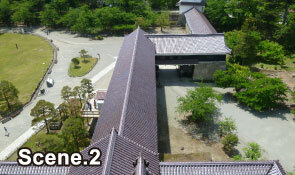 On the third floor an introduction of the Boshin War (battle bet ween samurai and Meiji governmental forces) is given. The fourth and fifth floors make up an observation platform, from which one can look out at the city, see Mt. Bandai?the symbol of the region?and also see Aizu’s nationally renown rice fields. Top quality brands of sake are made using the rice from this area. Even though the castle stands in the middle of the Aizu Plains, because it is quite high, the view is excellent. You can also see a wonderful view of Mt. Bandai (during clear weather). GAMO Ujisato was famous as not only a great feudal lord and Chr istian daimyo but a tea master, who was a head of 7 disciples of SEN Rikyu. When TOYOTOMI Hideyoshi the shogun ordered the death of Rikyu for treason in 1591,GAMOU Ujisato invited his 2nd son,SEN Sshoan to Aizu in order to protect him and to continue the SEN family and Rikyu`style of tea-ceremony. 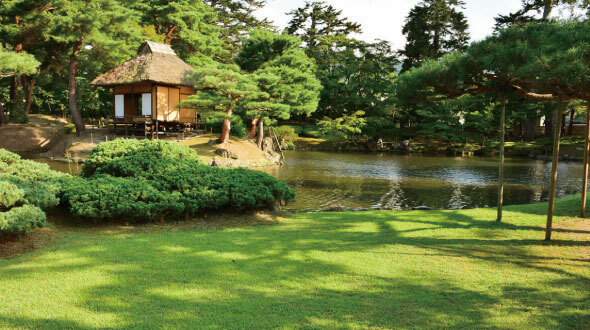 Then SENshoan build Rinkaku for GAMOU Ujisato in the castle grounds. The defeated Aizu clan in the Boshin Civil War moved to Tonami, the northern-most point of Japan proper. In 1872, the Morikawas moved Rinkaku down to their land fearing its demolition with the castle and k ept it in good condition for 120years. In1990,Aizu-Wakamatsu City moved it back to its original place to commemorate the 90th Anniversary of Aizu-Wakamatsu Municipal System and handed it down to posterity. Oyakuen was built as a villa for the lord of the region on a site reputed to be a place where one could get natural spring water which would cure the ailments of those who drank it. 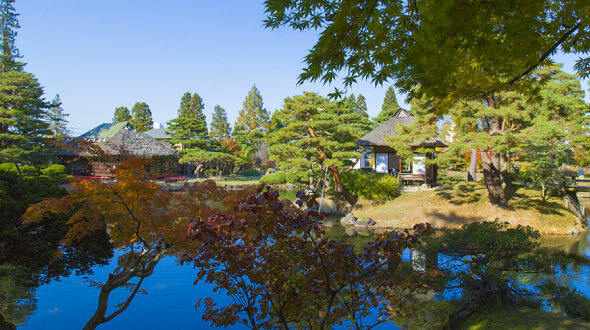 In 1696, following large-scale renovation undertaken by the lord’s initiative, it became a garden representative of the typical Japanese style gardens in the Tohoku region. Though it was in a state of ruin after the Boshin War in 1868, it was designated by the State as a Nationally Renown Garden in 1932. 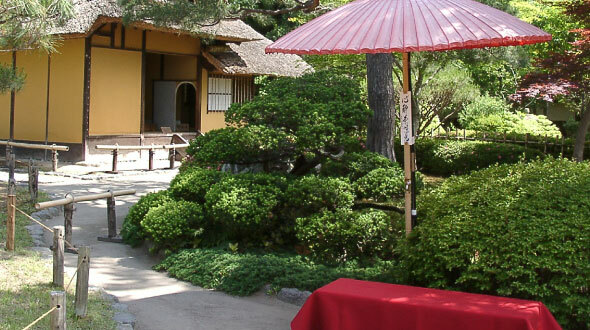 The necessary repairs were made , and it is still cherished today as a beautiful Japanese garden. 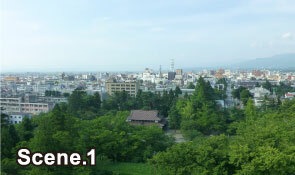 The view from the “Ochaya Goten” building is said to be the most beautiful. The area lord used it as a place of rest. You can also see the mountains in the distance and the balance between the positions of the pond and the centrally located Rakujutei. The second Chinese character used to write “Yaken” means medicine, and it refers to the medicinal herbs grown here. This tradition was begun by the area Lord, who planted the herbs in order to spare people from disease and sickness. In the latter half of the 17th century, ginseng cultivation began, and was exported as one of the Aizu region’s specialties. Long ago, this street was named Nanukamachi, for the market that was held there on the 7th day of every month. Modern-looking buildings designed and constructed during the Taisho period, and wa rehouse-style shops lend a nostalgic atmosphere to this street. About 10-minute ride from the center of Aizu-Wakamatsu City. Aizu geigi (local geisha) culture still thrives here. Visitors can enjoy brilliant performances of Japanese dance, shamisen, and nagauta music by geigi performers. It is located along the Okawa Valley. Enjoy the stunning scenery of all four seasons. 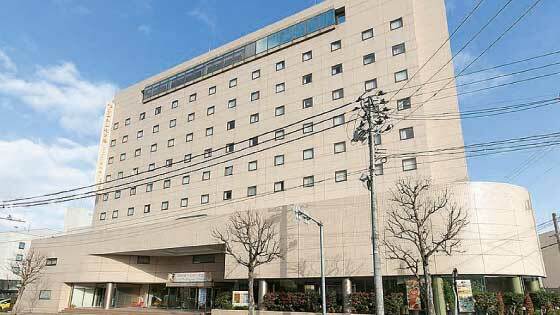 Quite a few hotels are located around JR Aizuwakamatsu Station, and they are about a few-minute walk from the station.Good transportation to sightseeing areas around the city, such as Iimoriyama and Tsurugajo Castle, can be found here. Located inside the JR Aizuwakamatsu Station. 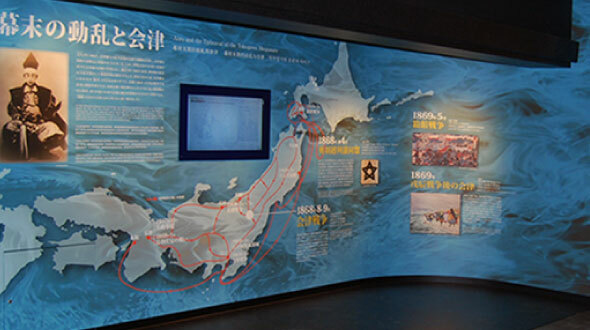 For non-Japanese tourists, an English speaking staff member is permanently stationed at the center. 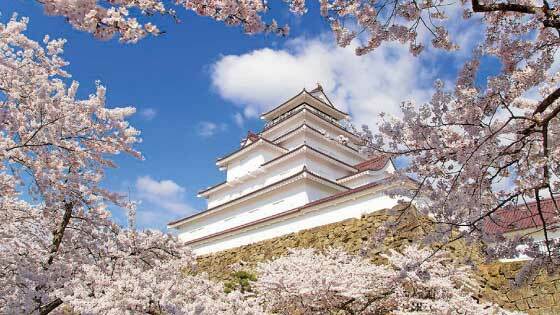 Introduces major historic landmarks and the history of Aizu including Tsurugajo Castle (the symbol of Aizu) and Oyakuen Medicinal Herb Garden. 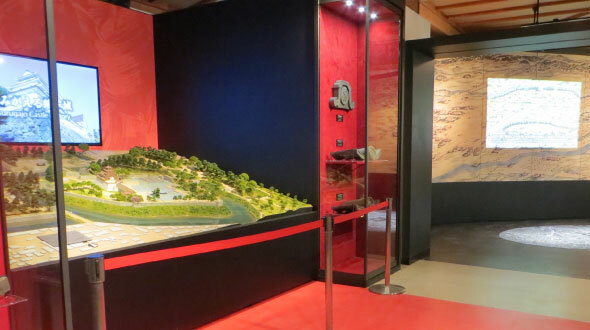 The website also provides a variety of tourism information including information about Tsurugajo Castle. English, Chinese,Taiwanese and Korean pages are available. A local railway in the Aizu area. 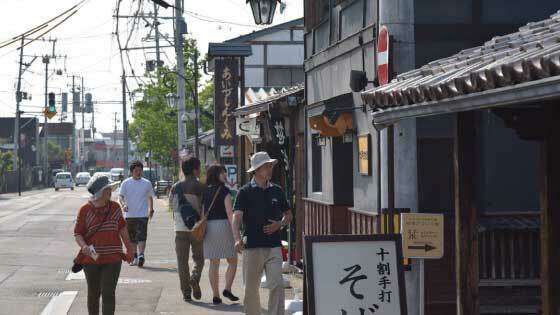 On their website visitors can find timetables for Asakusa to　Aizu. There are also fun local train trips such as the Torokko Ressha (a trolley train) and　Ozashiki Ressha (a train with a Japanese-style room on board) available. 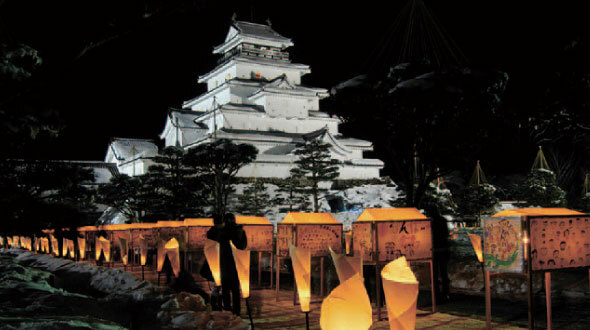 Visitors can find tourism information on Aizu, such as model sightseeing courses in Aizuwakamatsu, events, dining options, and hands-on activities. English, Chinese, Taiwanese and Korean pages are available. Tobu Railway’ s portal site. The following information is available: the state of operating trains, route maps and fare, timetables, access and train line information, tourism information about Tokyo Sky Tree, Nikko, Kinugawa and other sightseeing spots along the Tobu Line, and the latest information for Tobu Railway and Tobu Group companies. 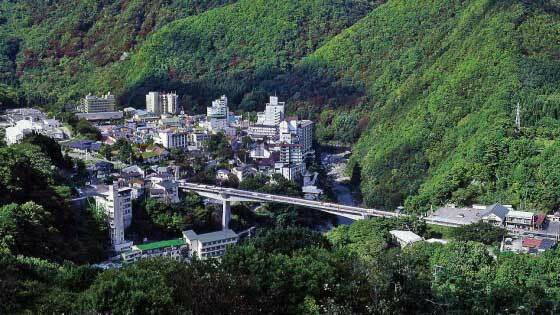 Introduces information about tourism and events within the 17 municipalities in the Aizu area. 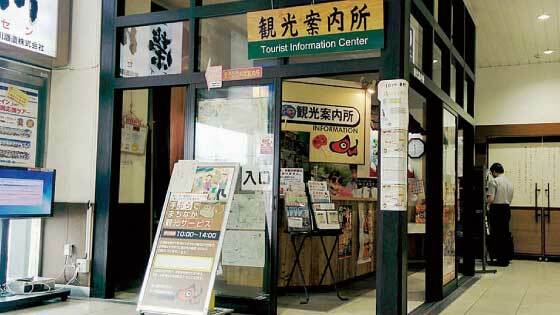 This website is highly recommended for collecting tourism information around the Aizu area, such as model courses for sightseeing, event information, and downloading access information and brochures. 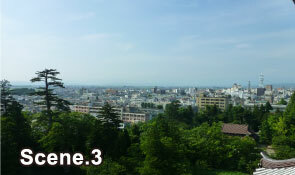 Aizu Bus’ s website is useful for bus trips to Aizu and sightseeing in Aizu. 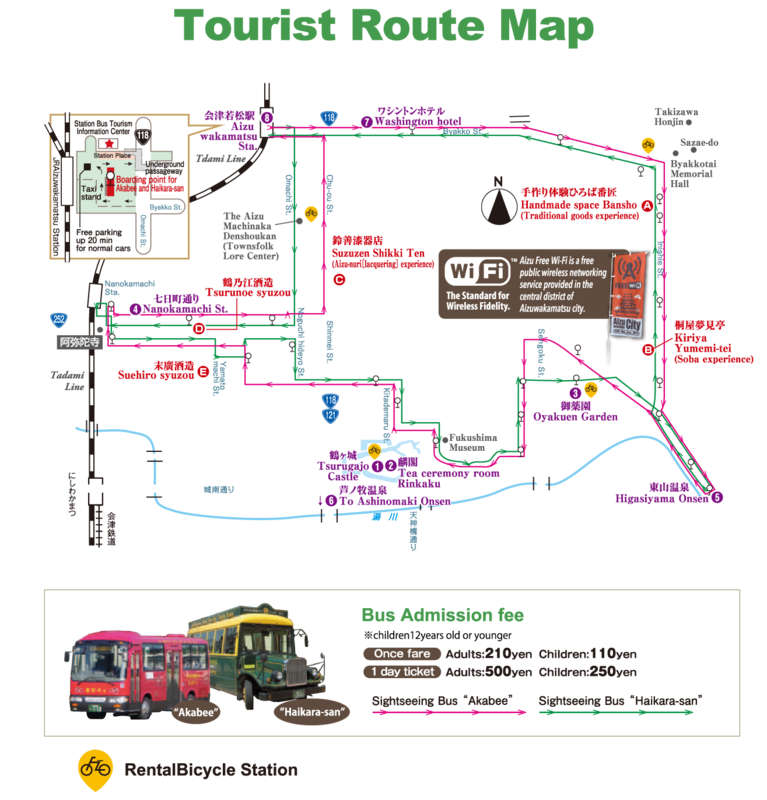 You can find timetables for fixed-route buses, bus timetables, and terminals and stops for highway buses, as well as Aizu tourism information.